Payout is based upon oil production from March and gas production from February. Permian Basin Royalty Trust (NYSE:PBT) announced yesterday its May monthly distribution of $0.088488 per unit, based principally upon production during the month of March 2013 for oil and the month of February 2013 for gas. The board of directors said the dividend is payable on June 14 to the holders of record at the close of business on May 31. The month's distribution increased from the previous month's $0.06088 due to increased oil production and higher oil prices offset by lower gas prices. Gas production to the trust continues to be affected by "prior period adjustments being processed," even though the production of the underlying properties is relatively flat month to month. The trust reported that gas production for the properties from which the royalty was carved totaled approximately 259,426 million cubic feet at an average price of $2.95 per Mcf while oil production was 93,451 barrels at an average price of $85.44 per barrel. While there has been minimal effect on the distributions paid by Permian, the trust continues to evaluate a $4.5 million overpayment claim that was recouped by ConocoPhillips back in September and October 2011 and are being processed through the monthly distribution. The latest payment would equate to a $1.06-per-share annual dividend, yielding 8.1% based on the closing price of Permian Basin Royalty Trust's stock on May 20. 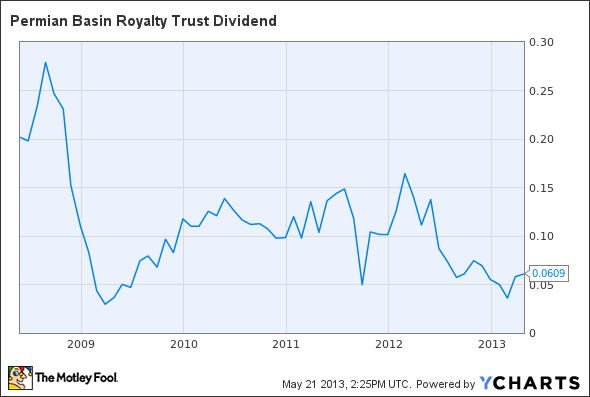 PBT Dividend data by YCharts. Does not include just-announced payout. Has Permian Basin Royalty Trust Become the Perfect Stock?